A broad feature occurring on one side of the position of a spectral line or band. The matter producing this feature is traveling at much greater speeds than that producing the main peak and thus has a greater Doppler shift. A redshifted wing (i.e. shifted to longer wavelengths) is produced by gas receding from us, a blueshifted (shorter-wavelength) wing by gas moving toward us. Projection on the side of a building that is smaller than the main mass; often one of a symmetrical pair. the part of an aircraft (airplane, glider, or winged missile) whose primary function is to produce lift during flight in the atmosphere. Wings are classified in three projections (views): top (parallel, delta, or tapered), side (according to the type of section; see Figure 1), and front (dihedral, inverted-gull, or gull wings; wings with recurved ends; and curvilinear wings). Figure 1. 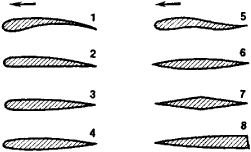 Types of wing profiles: (1) concave-convex, (2) plane-convex, (3) biconvex unsymmetrical, (4) biconvex symmetrical, (5) reflexed, (6) lenticular, (7) double-wedge, (8) wedge. The arrow indicates the direction of flight. cables for the movable aerodynamic surfaces, heating and cooling apparatus, and various equipment, as well as engines and armament, are usually placed inside the wing. In flight and during landing, a wing operates like a hollow beam, which is able to absorb air and inertial loads in any direction. The wings of subsonic aircraft are made of Duralumin, high-tensile steel, composition materials, reinforced plastics, and alloys of titanium, magnesium, and beryllium. Wood, plywood, and cloth are used primarily for light airplanes and gliders. Heat-resistant alloys of vanadium, tantalum, tungsten, and other refractory metals, as well as heat-shielding coatings and heat-insulating materials, are used for the wings of supersonic and hypersonic aircraft and spacecraft, which undergo intense heating during flight in the atmosphere. The efficiency of a wing is rated according to many parameters, the most important of which are the aerodynamic properties, the mass ratio, the torsional and flexural stiffness, the technological and service qualities, and the production cost. (1) A term designating the right or left part of the disposition, combat formation, or operational concentration of troops, for instance, the right or left wing of an army or a front. (2) In the US Air Force a wing is the basic organizational and tactical military unit. Depending on the mission and the armament, wings are divided into heavy-bomber, medium-bomber, aerospace (rocket), reconnaissance, and service wings. A wing has a staff, from two to five squadrons, airfield-service groups, and subunits of matériel support. Two or three wings make up an air division. An airfoil on the side of an airplane's fuselage or cockpit, paired off by one on the other side, the two providing the principal lift for the airplane. Any of the paired appendages serving as organs of flight on many animals. There is a particular angle of attack of a wing that provides the necessary lift with the least drag. Wing area selection attempts to have the airplane fly at this angle of attack at the desired speed and within the range of desirable altitudes. Of course, takeoff and landing fields are important in area selection. A larger wing area permits slower flight, which is associated with shorter takeoff acceleration distances and shorter stopping distances after landing. Wings must be designed to stall safely. Above the maximum angle of attack at which the flow will remain smoothly attached to the wing surface, there is a sharp loss of lift and a large increase in drag. This is known as the stall, a condition that is normally avoided. Wings are designed to stall near the root first so that the tendency to roll sharply is minimized and the ailerons on the outer wing remain effective. This is done by varying the airfoil sections and thickness ratios across the span in a careful manner. The flight of airplanes is controlled primarily by varying the magnitude and direction of the wing lift and by varying the thrust or power contributed by the engines. An important aspect of flight is the speed, which is controlled by adjusting the wing angle of attack with respect to the oncoming airstream. The angle of attack is adjusted by varying the angle of the elevator, a control surface usually located on the horizontal tail. After adjusting the flight speed by using the elevators, the angle of the flight path, zero for level flight, is controlled by setting the engine thrust. High-speed aircraft also use spoilers, essentially plates ahead of the flaps, to lose lift on only one side to roll the airplane. These spoilers are also used symmetrically to slow down an airplane and increase the rate of descent. Spoilers are also used after touchdown to quickly reduce lift and dump the weight on the braked wheels, thereby greatly improving the stopping effectiveness. 1. A subsidiary part of a building extending out from the main portion. 2. In a theater, the offstage space at the side of the acting area. 3. One of the four leaves of a revolving door. The part of a heavier-than-air aircraft that produces aerodynamic lift to support the aircraft in flight and counters the forces of gravity. (WINdows Games) A programming interface (API) that lets Windows application developers access the video frame buffer directly. It allows game programs to be written to run as fast in Windows as they do under DOS. In the United States (and maybe all around the world), there is a renewed interest in angels. People are thinking about them and surrounding themselves with images of them. Angels seem to have gained respect and appreciation, and their wings are their most famous and valuable characteristic. Wings are associated with flying, which in turn is associated with freedom and the heavenly domain. Dreaming about wings suggests that you may have a desire to be “angelic, ” have a need for angelic protection, or want to transcend current difficulties and problems. Consider the mood of your dream and what type of wings you were seeing. If they were animal wings, look up birds. Superstition-based dream interpretation books say that if you hear a gentle flopping of wings you will hear good news. However, loud and powerful flapping of wings is said to be a warning against illegal or immoral activities, specifically those in which money is involved.